A support group for those affected by heart problems will cease operations after almost two decades. In a final gesture of goodwill, the Cardiac Resource Group donated more than $3,000 of its funds to the Bermuda Hospitals Charitable Trust, the Agape House hospice and the Bermuda Red Cross. Read more.. The committed group of individuals who voluntarily organize the Bermuda Hospitals Board [BHB] has followed up on its success of last year in holding the second BHB Variety Show on April 11, raising $13,000 for the new acute care wing at KEMH. The Wheddon family recently decided to have Major Wheddon’s name engraved on a memorial brick, which will be part of the Legacy Walkway in the new Acute Care Wing of King Edward VII Memorial Hospital. The Bermuda Hospitals Charitable Trust has offered donor bricks to anyone who gives $1,000 and wishes to celebrate an important event or loved one or share an important community message. Donations will contribute toward the Why it Matters campaign which supports the redevelopment project costs of the hospital’s new Acute Care Wing. ndurance Specialty Holdings Ltd has donated $250,000 to the Bermuda Hospitals Charitable Trust. Mid Atlantic Athletic Club, in partnership with The Fairmont Southampton and The Fairmont Hamilton Princess, has made a donation of $6,640 to the Bermuda Hospitals Charitable Trust. The funds were proceeds from the 38th Annual Fairmont to Fairmont Race that was held last month. The Bermuda Hospitals Charitable Trust [BHCT] received a $3 million donation from Arch Capital Groupand XL Groupas a joint gift for the new reception lobby in the Acute Care Wing. This donation was made as part of the Why it Matters campaign, which is still actively raising funds to reach the $40 million target set to fund the initial payment for the KEMH Redevelopment Project. Bacardi Limited, the largest privately held spirits company in the world, today announced its commitment of $500,000 to the Bermuda Hospital Charitable Trust [BHCT] “Why it Matters” campaign. A spokesperson said, “During a donation ceremony at the Bacardi global headquarters, Bacardi Limited Chairman Facundo L. Bacardi and Chief Executive Officer Michael J. Dolan presented BHCT Executive Director Ralph Richardson and BHCT board members Gavin Arton and David Lang with a letter of commitment for $500,000. Bermuda Hospitals Charitable Trust [BHCT], an independent non-profit organization that leads fundraising and charitable giving for Bermuda Hospitals Board [BHB], today presented an initial $20 million dollar payment to BHB to fund the King Edward VII Memorial Hospital Redevelopment Project. The Bermuda Hospitals Board (BHB) officially received the key to the new Acute Care Wing yesterday in a ceremony at King Edward VII Memorial Hospital. Final building work at the site is still ongoing but BHB CEO Venetta Symonds said the event marked a key point in preparing the facility for its grand opening in September. For almost half a century, Baltimore teacher Luciel (Joni) LeKites visited Bermuda every year, describing its beauty to her friends. Now, two years after she died at the age of 88, a group of her friends and colleagues have come to her favourite island to honour her memory. Ms Tobash said that while on the Island, they heard about the "Why It Matters" campaign to raise funds for the new Acute Care Wing at King Edward VII Memorial Hospital, and decided to make a donation of $300 in their late friend's name. The Physicians & Staff of Island Health Services have donated $15,000 to the Why it Matterscampaign in support of the new Acute Care Wing. Scheduled to open in September, the new wing will feature 90 patient rooms, a new Emergency Department, Surgical Unit, Diagnostic Imaging Unit, Oncology, Dialysis and Out Patient Services. OIL Group of Companies (OIL) has donated $275,000 to Bermuda Hospitals Charitable Trust (BHCT). The funds will go towards the ‘Why it Matters Campaign’ which aims to raise $40 million for the new Acute Care Wing at King Edward VII Memorial Hospital. The Wing is scheduled to open in September. Robert Stauffer, president of OIL, said: “The OIL Group of Companies has had a long term commitment to Bermuda. As such it was natural to make a commitment to support the Why It Matters Campaign. An ambitious fundraising campaign for Bermuda’s new hospital aims to raise about $9 million in time for the acute care wing’s expected completion at the end of September. Hospital staff have raised more than $10,000 for a fund-raising campaign to help pay for the new building at the King Edward VII Memorial Hospital. The push is on to get the final $10m needed for the Why It Matters campaign. The Bermuda Hospitals Charitable Trust has already raised more than $30m towards its $40m goal. The former director of the charitable ACE Foundation will lead the fund-raising drive to pay for the new hospital wing. Ralph Richardson, who has served on the boards on several non-profit organisations, replaces Wendy Augustus as the new executive director of the Bermuda Hospitals Charitable Trust (BHCT). Bank of Bermuda Foundation made history today with the fulfillment of its $10 million pledge to the Bermuda Hospitals Charitable Trust’s [BHCT] “Why it Matters” campaign. 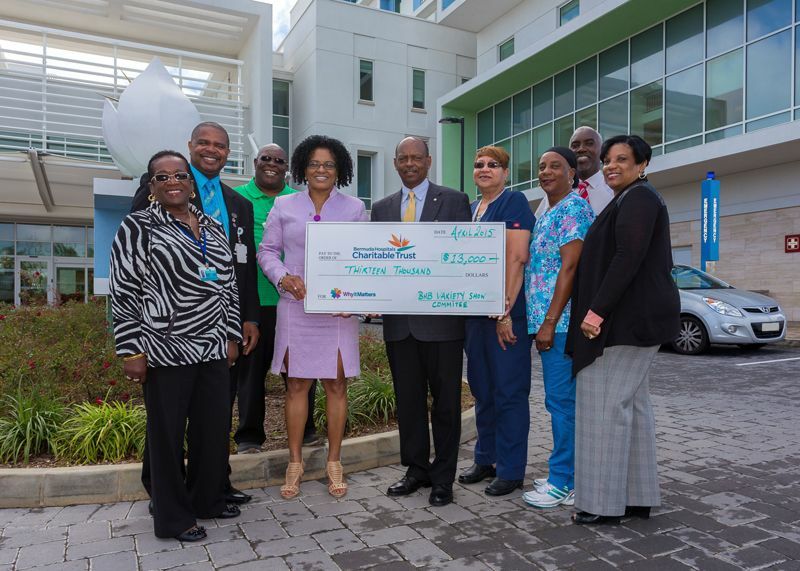 A spokesperson said, “The largest capital campaign in the island’s history, ‘Why it Matters’ supports the construction of the new Acute Care Wing that will transform King Edward VII Memorial Hospital into a revitalized, state-of-the-art hospital facility. The Bermuda Hospitals Charitable Trust (BHCT) today received a $100,000 donation made in honour of deForest “Shorty” Trimingham by Shorty’s wife, Dorothy Trimingham, and his daughter, Barrie Trimingham. The donation was made towards the Why it Matters campaign in support of transforming the King Edward VII Memorial Hospital into a state-of-the-art hospital facility. Island Trading has donated $5,000 to the development of the hospital’s new Acute Care Wing as the Bermuda Hospital Charitable Trust’s Why It Matters campaign continues. Bermuda Police Service has donated more than $16,000 to the Bermuda Hospital Charitable Trust to help fund the new hospital project. Saltus students raised more than $1,200 for the Bermuda Hospitals Charitable Trust’s “Why It Matters” campaign. This year the theme at Saltus Grammar School is ‘Lend a Hand,’ and the Bermuda Hospitals Charitable Trust (BHCT) is one of several charities for which students have been raising funds. Edmund Gibbons Ltd has given a half a million dollar donation towards the redevelopment of King Edward VII Memorial Hospital, the company announced today. A donation of $100,000 by the Kitson Group has pushed the fundraising campaign for Bermuda’s new hospital wing to the $30 million mark. Bermuda Hospitals Board thanked the Kiwanis Club of Hamilton, the Kiwanis Club of St George’s and the Kiwanis Foundation of New England & Bermuda District for a donation of $5,000. Funding for the new acute care wing of King Edward VII Memorial Hospital has received a $150,000 boost from a family of hoteliers. The Green family, who own the Fairmont Hamilton Princess Hotel, announced the donation to the Bermuda Hospitals Charitable Trust this morning saying they hoped it “will encourage other businesses and families to make financial contributions to this worthwhile cause”. Butterfield Bank has donated $500,000 to the Bermuda Hospitals Charitable Trust’s fundraising campaign. The charity is hoping to raise $40 million through its Why it Matters campaign, to help transform King Edward VII Memorial into a world-class facility by next year. The Jamaican Association of Bermuda presented a $2,000 donation towards the $40 million fundraising goal set by Bermuda’s Charitable Trust for the new hospital. The proceeds were raised when some 350 residents boarded the Bermudian for the association’s 51st annual celebrations of Jamaica’s independence on August 10. Are you a great gossip? Ever wanted to make a commercial, or radio ad? Do you know how to tell your friends what’s going on? If you answered “yes” to either of these then you should look out for a contest being run by Bermuda Hospitals Board and its charity – the Bermuda Hospitals Charitable Trust. Bermuda Hospitals Charitable Trust (BHCT) is pleased to announce that Bermuda Commercial Bank Limited (BCB) has made a donation of $250,000 to the Why it Matters campaign. A joint services golf tournament is on course to raise around $20,000 for charity, it was revealed at the weekend. The news came at the prizegiving, where Governor George Fergusson was at the Regiment’s Warwick Camp to hand over the awards to the winning teams. Bermuda Hospitals Charitable Trust (BHCT) announces that Ernst & Young Ltd., Bermuda has made a $300,000 donation to the Why it Matters capital campaign, which is raising funds to transform King Edward VII Memorial Hospital (KEMH) into a world-class hospital facility. AIG Bermuda has donated $100,000 to the Bermuda Hospitals Charitable Trust’s fundraising campaign bringing the total raised to date to $28 million. Catlin Group Limited has donated $1 million to the Bermuda Hospitals Charitable Trust’s (BHCT) fundraising campaign. The charity is hoping to raise $40 million to help transform King Edward VII Memorial into a world-class facility by next year. Bermuda’s young people have raised more than $3,000 to support the King Edward VII Memorial redevelopment project. Schools across the Island held fundraising events for the Bermuda Hospitals Charitable Trust’s (BHCT) Why it Matters campaign, which is seeking to raise $40 million to build the new acute care facility. Ministry of Education staff were among the more than 1,900 people from approximately 60 companies, four schools and 150 hospital employees that raised $20,000 for Bermuda Hospitals Charitable Trust for the Island-wide denim day on April 12. Since the start of the Why it Matters capital campaign, many organisations have stepped up and demonstrated their generosity through gifts of support. Even so, the recent donation of $250,000 by Bermuda’s KPMG, announced on April 2, 2013, was nothing short of extraordinary. The firm’s donation takes the running total for the campaign to almost $28 million, a remarkable milestone given that the campaign was launched just a year ago in April 2012. Kaelyn Sings "Why it Matters"
Let’s admit it—taking a hospital fundraising campaign as the subject for a pop song is, well, unusual. But that didn’t stop 17-year-old Bermudian recording artist Kaelyn Kastle from doing just that—and succeeding. There’s a very good chance that someone you know, if not you yourself, has met Dr. Wilbert Warner for a medical appointment. Because for the past quarter-century, Dr. Warner has been a mainstay in Bermuda’s medical community. A Bermudian “born and raised,” Dr. Warner left his home at 18 to attend McGill University in Canada, where he did his undergraduate work and afterwards completed his medical degree and residency. Returning to Bermuda in 1987, he joined the Bermuda Hospitals as a medical specialist, where he eventually became Chief of Medicine in 1990-94 and again in 2003-2007. In addition, he has served since 2004 as a medical representative on the Board of Trustees of the Bermuda Hospitals Charitable Trust. Today, Dr. Warner remains active as a member of the KEMH medical staff while maintaining an active independent practice in Hamilton. Recently, we sat down with Dr. Warner to learn his perspective on how healthcare has changed in Bermuda. Lindo’s Group of Companies has made a donation of $500,000 to the Why it Matters campaign in support of the King Edward VII Memorial (KEMH) Redevelopment Project. Giorgio Zanol, President of the Lindo’s Group of Companies, says: “Over six years ago when it became apparent that Bermuda needed a new hospital, we decided that it was necessary for Lindo’s to contribute to such a project, which is so vital to our whole community. As a family business we can see the importance of a new hospital for Bermuda’s families and their future grandchildren, the next generation. We opened a special family savings account and have pledged money each year for this purpose. We are blessed to be working together and to enjoy good health so this is our way of showing our appreciation.